Lake Placid was first on our list. We had postponed the trip a couple of times over the past few years. We were too busy, the destination wasn’t exotic enough, other places tempted us more…we came up with plenty of excuses to delay our discovery of this charming oasis in the Adirondacks. Our hotel room at the High Peaks Resort in Lake Placid boasted prime lakefront access and views. Following mornings spent hiking and sightseeing, Mirror Lake beckoned us with its crystalline waters. Armed with a couple of good books, I wiled away the afternoons relaxing and reading on a lounge chair, calmed by the steady sound of rippling water and 360° views of the lush vegetation and rolling hills. Ever on the lookout for off-the-beaten-path activities, I found Rail Explorers USA, which recently converted a six-mile stretch of railroad between Saranac Lake and Lake Clear into a railbiking journey. Riding tandem-like bicycles imported from South Korea, we pedaled along the tracks through the forest and over the Lake Colby causeway. Chloe and Sophie propelled us gently uphill for a good portion of the trail. The novelty of the experience more than compensated for my intentionally neglecting to tell them they’d actually be giving their legs a workout during the ride. After our unique Rail Explorers adventure, we took a short drive to Lake Tupper, where we visited the Wild Center, a beautiful nature preserve and exhibition hall whose main attraction is a newly built “wild walk” through the treetops. On a clear day, the view from the towers is breathtaking. The indoor museum offers short films, interactive exhibits and live displays of native animals, including a couple of resident river otters that put on a good show for their human guests. 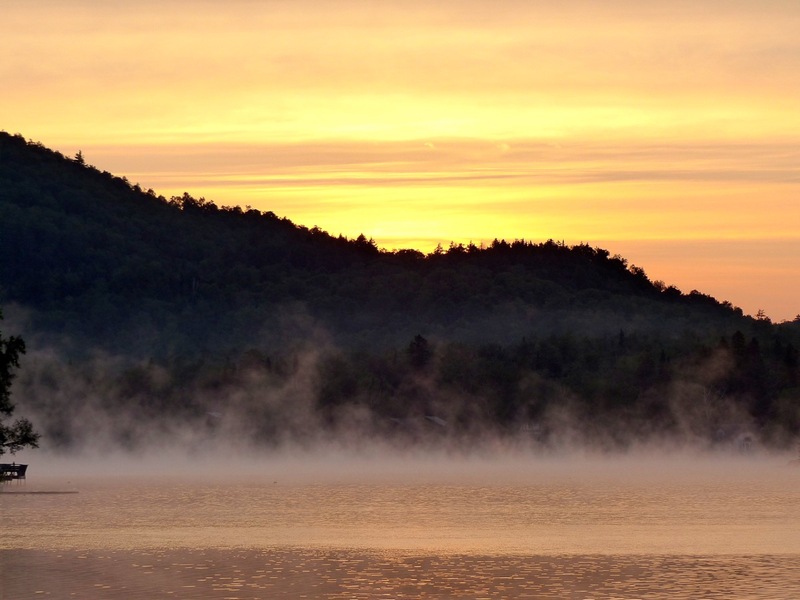 A trip to the Adirondacks during the summer would not be complete without hiking. Although we’ve enjoyed our share of exploring over the years, most recently during last summer’s trip to the Grand Canyon and Utah national parks, it’s not always easy to get the girls moving, particularly Sophie. Our Lake Placid trip, however, was relatively brief and we only had time for one hike. Careful to choose an outing that would be challenging enough to entice a 9-year old yet simultaneously short enough to prevent her from turning into a monster, I settled on Mt. Jo, a moderate 2.6 mile (round-trip) hike that rewards the determined climber magnificent vistas upon reaching the summit. In other words, great bang for the buck. We ventured out on a cool overcast morning. 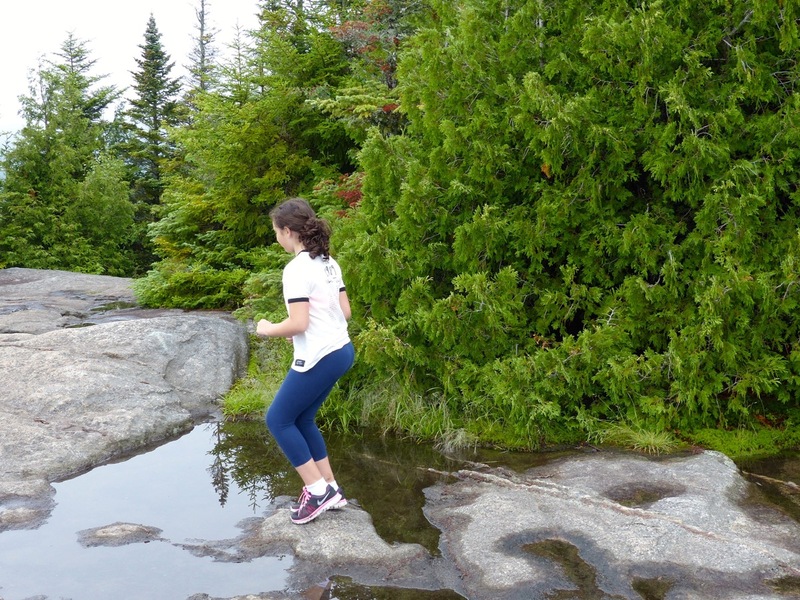 The trail was rocky, slippery and steep – the perfect hiking trifecta for kids. Not so perfect for clumsy adults. We didn’t encounter anyone on the trail until we reached the summit, when we were greeted by an Adirondack Mountain Club guide who enthusiastically announced that we were the first to arrive that day. Sophie, always happy to be first for anything, did a jig. Although the mist and clouds limited our views of the surrounding region, the weather added a rich dimension to our experience. We relaxed on the summit for some time. Sophie danced and skipped and jumped on the boulders. Chloe read “They Never Came Home” by Lois Duncan (remember that one, fellow Generation Xers? ), hoping that the scenery surrounding her would lend atmosphere to a novel that turned out to be not so creepy after all. 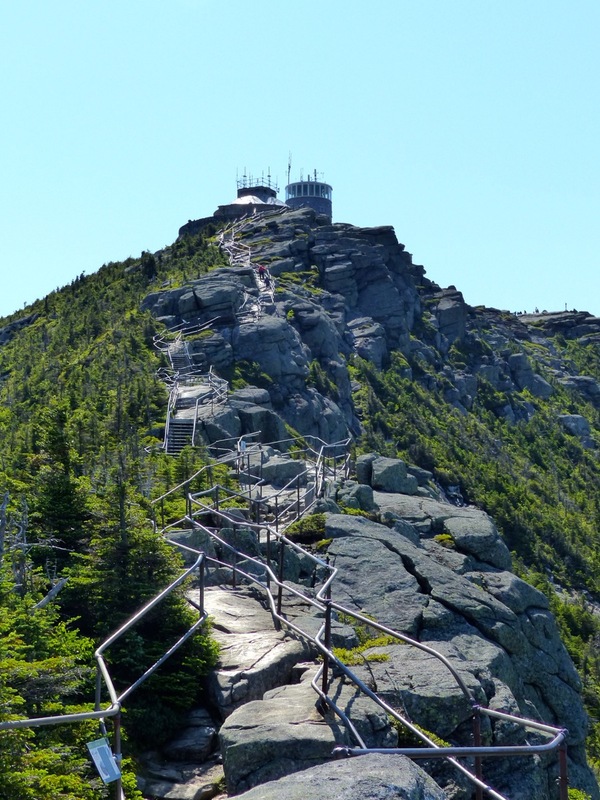 A trip to the Lake Placid region is not complete without a visit to Whiteface Mountain, New York’s fifth highest peak. We drove up the scenic Whiteface Veterans Memorial Highway, parked the car and climbed a steep path, which looks like a mini-Great Wall of China, to reach the summit. On a clear day, you can easily see Vermont, Lake Champlain and Canada. 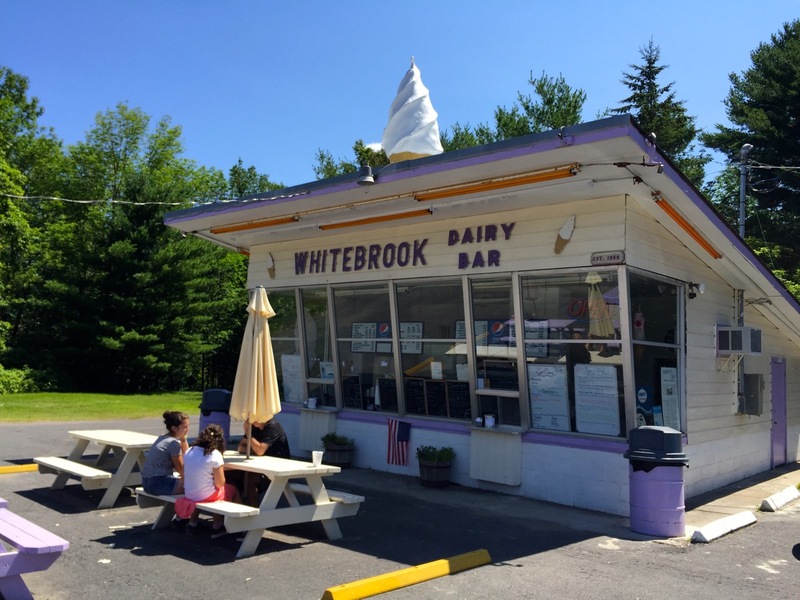 No visit to the countryside is complete without a stop at a local ice cream stand. After our successful ascent to the top of Whiteface – at least we walked to the summit from the car; most people take the elevator (!) – we rewarded ourselves handsomely for our efforts. 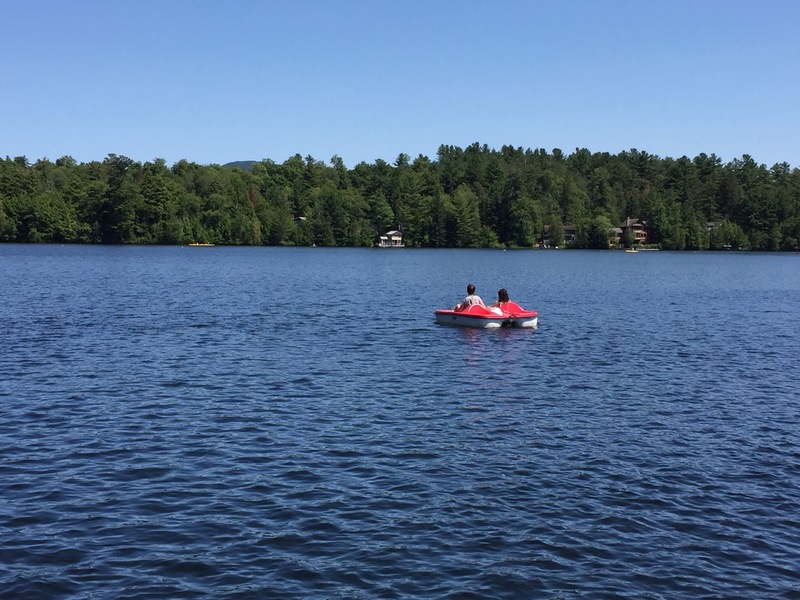 As soon as we returned to the hotel, the girls commandeered a pedal boat and enjoyed the serenity of their surroundings in the middle of the lake, until it was boring – after about 10 minutes they came back to shore and were happy to be lazy once again. 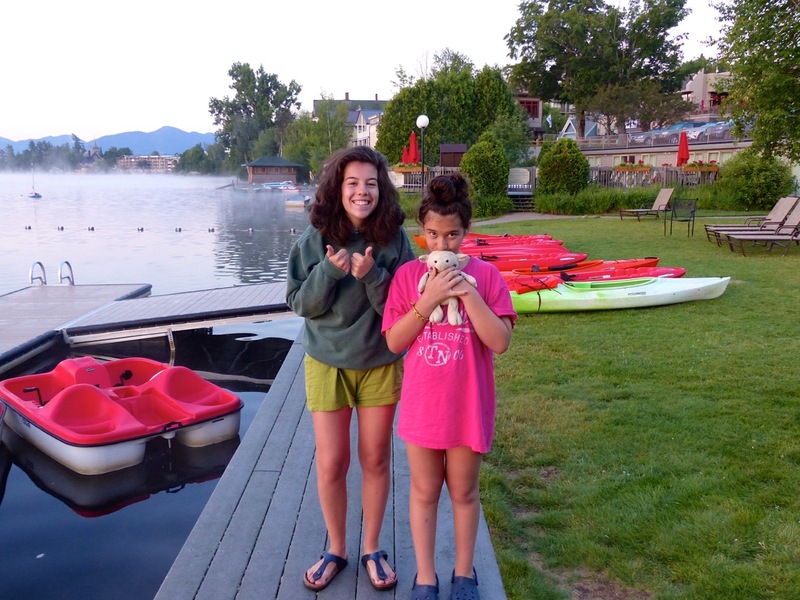 On our last morning, Chloe convinced her Papa and Sophie to wake up at 5:22 am to witness the sunrise over Mirror Lake. I was happy to let them take the photos for me. It’s rare that our family vacations meet with unanimous approval. This time, however, we were all in agreement – one day, we’ll return to Lake Placid for more. What are your favorite not-too-far-from home destinations? Do share! Beautiful. Love the railbiking. That is so cool! Also, the Wild Center. That is amazing. A walk through the treetops? Yes, please. So true: “while the world offers much beauty to discover, sometimes it’s nice to explore the treasures in our backyards”. Thanks, Sarah. It was a glorious few days – as I get older, these kinds of trips are precious to me! Hope you’ll enjoy some R&R this summer, too.